I did not plan on going to the Jason Wu Collection opening at any Target on February 5, 2012. However, I ran out of milk and needed some Super Bowl supplies that morning. I arrived at 9:30am to Target expecting a bustling atmosphere. That was not the case. Target was not very busy even with Super Bowl that afternoon. I did see a last minute 43 in TV purchase by a gentleman. The selection of Jason Wu items were miniscule. 1 skirt which I tried on, 2 Tie Neck blouse, 2 Tie Neck Tee, 2 cardigans, 1 dress, 1 sleeveless shirt and NO accessories. I am assuming by the lack of Jason Wu items, there were probably a group of people waiting outside of Target that morning for the Jason Wu opening. I did manage to avoid if any chaos and even tried on a few items. I was shocked at the Size 8 for the skirt. I normally wear a 6 in bottoms. However, even at a size 8, it is worn pretty high up on the waist rather than by the hips. The loose pleats are pretty and it is lined. There is some weight to this pieces, not as light as one might expect. The length of the skirt hits right above my knee. 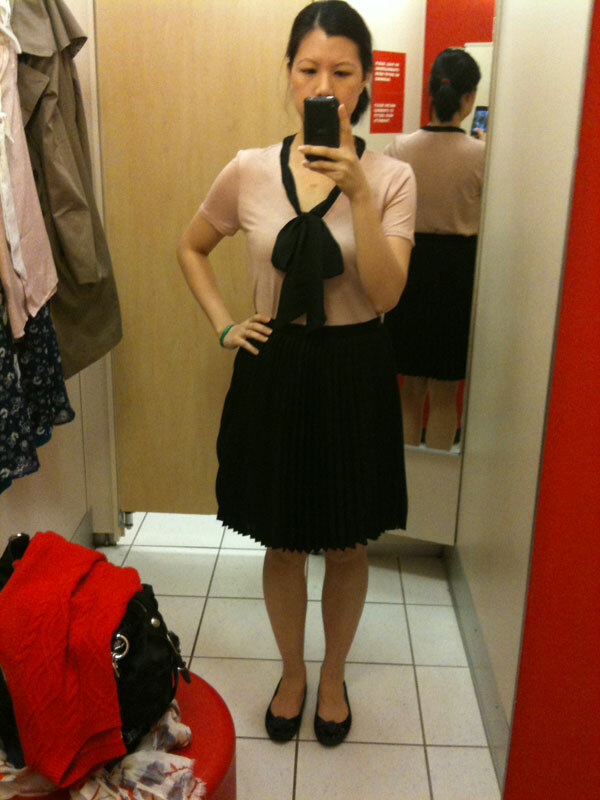 I already have a pleated skirt from Express (very old piece) so I didn’t pick this black skirt. This is a GEM! At $34.99, it is priced higher than other Target brands, but it is the same as a Missoni blouse. The fit is very boxy and loose. The material is all right. I have to check but I think it’s polyester. The snap buttons are sturdy. 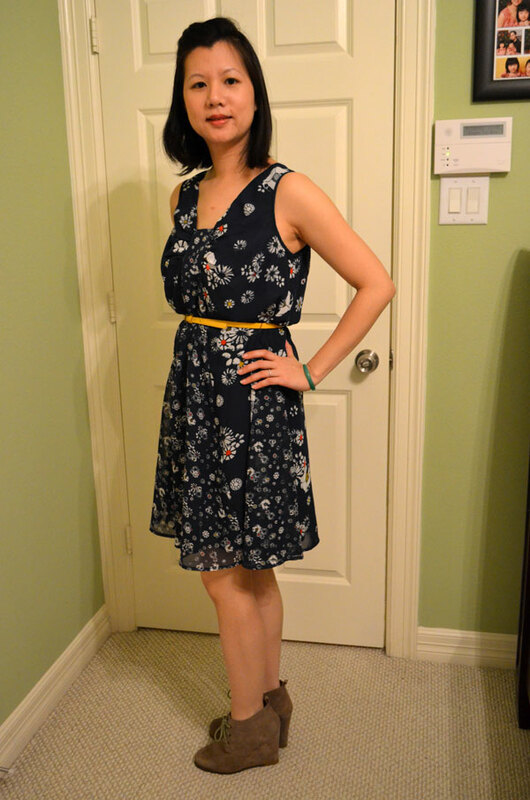 Jean at Extrapetite.com made a comment about the tie neck and how it twists around the neckline. She thinks it might be bad sewmanship of how erratic the twists were. I did think the same when I saw it both on the Blush blouse and on the Tie Neck Tee. However both shirts had the same inconsistent almost hurriedly twists. So it might be purposeful. First thought when I put it on without the belt was “Holy Moly! This looks like one of my maternity dresses!! !” It was very billowy and roomy almost like a mumu. However, with the belt the dress becomes more classy and wearable in public! I love the contrast in prints on the front of the dress. 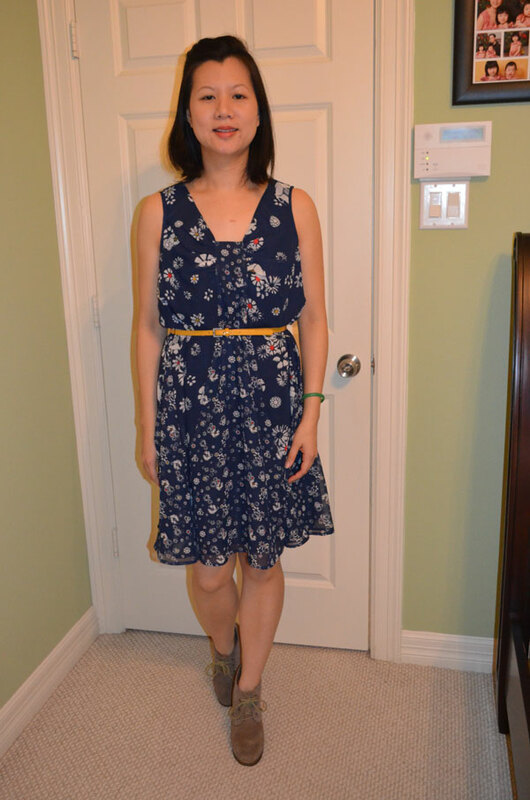 There is a sleeveless tank/blouse with a mesh yoke that has the same print as this dress. I saw 1 left on the rack but I have enough tanks. I’m super elated that I managed to purchase 2 Jason Wu items without being shoved and without enduring a chaotic atmosphere. I really hate situations where nasty attitudes come out and play. So Target.com is sold out in Jason Wu stuff. Did you manage to score any JW items?